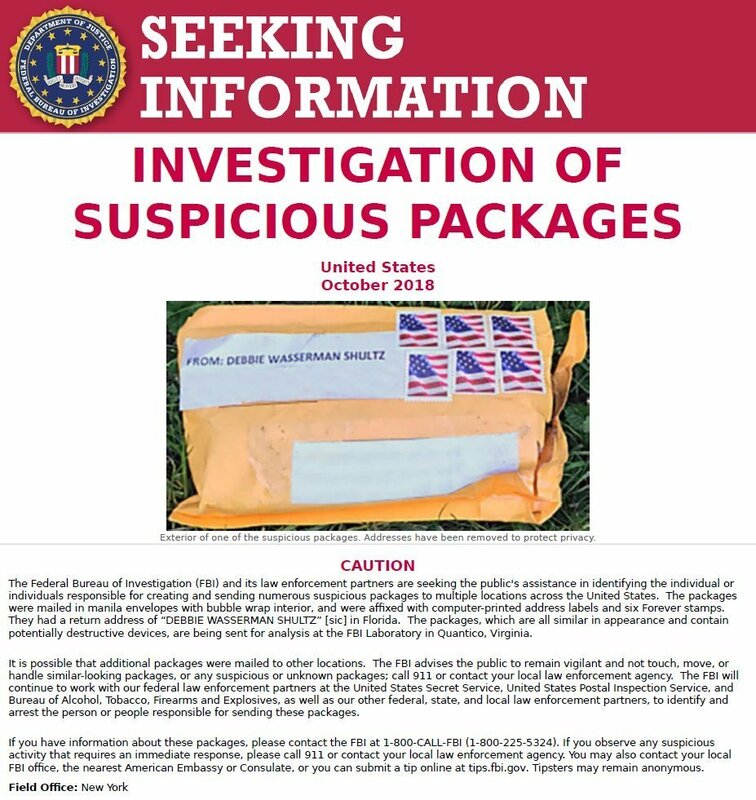 WASHINGTON (AP) — Federal authorities arrested a man in Florida on Friday in connection with the mail-bomb scare that widened to 12 suspicious packages, the Justice Department said. Law enforcement officers were seen on television examining a white van, its windows covered with an assortment of stickers, in the city of Plantation. They covered the vehicle with a blue tarp. The man was in his 50s, a law enforcement official said, but his name and any charges he might face were not immediately known. Department spokeswoman Sarah Isgur Flores said authorities planned to announce more information at a press conference. The development came amid a coast-to-coast manhunt for the person responsible for a series of explosive devices addressed to Democrats including former President Barack Obama, former Vice President Joe Biden and Hillary Clinton. Law enforcement officials said they had intercepted a dozen packages in states across the country. None had exploded, and it wasn’t immediately clear if they were intended to cause physical harm or simply sow fear and anxiety. Law enforcement officials told The Associated Press that the devices, containing timers and batteries, were not rigged to explode upon opening. But they were uncertain whether the devices were poorly designed or never intended to cause physical harm. Homeland Security Secretary Kirstjen Nielsen, in an interview Thursday with Fox News Channel, acknowledged that some of packages originated in Florida. One official told AP that investigators are homing in on a postal facility in Opa-locka, Florida, where they believe some packages originated. The package addressed to Booker was found during an oversight search of that facility, according to a law enforcement official. Most of those targeted were past or present U.S. officials, but one was sent to actor Robert De Niro and billionaire George Soros. The bombs have been sent across the country – from New York, Delaware and Washington, D.C., to Florida and California, where Rep. Maxine Waters was targeted. They bore the return address of Florida Rep. Debbie Wasserman Schultz, the former chairwoman of the Democratic National Committee. The common thread among the bomb targets was obvious: their critical words for Trump and his frequent, harsher criticism in return. Jeff Zucker, the president of CNN Worldwide, said in a note to staff that all mail to CNN domestic offices was being screened at off-site facilities. He said there was no imminent danger to the Time Warner Center, where CNN’s New York office is located. The devices were packaged in manila envelopes and carried U.S. postage stamps. They were being examined by technicians at the FBI’s forensic lab in Quantico, Virginia. The packages stoked nationwide tensions ahead of the Nov. 6 election to determine control of Congress — a campaign both major political parties have described in near-apocalyptic terms. Politicians from both parties used the threats to decry a toxic political climate and lay blame. The bombs are about 6 inches (15 centimeters) long and packed with powder and broken glass, according to a law enforcement official who viewed X-ray images. The official said the devices were made from PVC pipe and covered with black tape. Associated Press writers Laurie Kellman, Ken Thomas, Jill Colvin and Chad Day in Washington and Jim Mustian, Deepti Hajela, Tom Hays and Michael R. Sisak in New York contributed to this report.